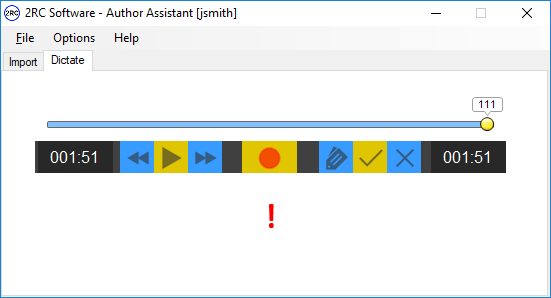 Author Assistant is a Windows desktop application for professionals authoring dictation files. Author Assistant integrates with popular digital recorders to provide the seamless importing of digital audio files from the recorder and then archival and distribution. Dictation audio files can also be imported from other sources. Thirdly, dictations can be recorded directly using Author Assistant. Author Assistant is ideal for professionals in health services, law enforcement, legal services, and the insurance industry. Transcribe Assistant is a Windows desktop productivity tool for professional transcriptionists to convert voice files into text traditionally or using speech recognition. It seamlessly integrates with Dragon Naturally Speaking and 2RC's cloud-based speech recognition service. It can be used in a stand-alone environment or in a networked environment of multiple transcriptionists. Includes footpedal support and support for more than 18 audio/video file formats including DSS/DS2. Call Assistant is a VOIP/SIP interface that accepts calls and allows the caller to author a dictation. Calls can originate from any phone including SIP (Soft) phones on a PC and mobile devices. Configurable and unlimited number of metadata/demographics entry. Required length or length range. Overwrite, truncate, and auto-append recording modes. Configurable descriptor (XML) file creation, supporting 2RC, Philips and Dataworxs systems. Configurable DTMF tone mapping on a per-caller basis. 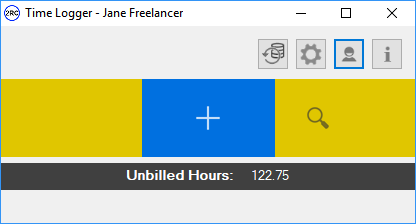 Time Logger is a Windows desktop application for consultants and freelancers that tracks time spent for specific customers and specific projects. Each time log entry can be described and assigned a billing rate. A flag indicates if the time log has been billed or not. Email Client is a simple SMTP email client by 2RC Software. The email utility is useful for diagnosing email SMTP setting issues and working out connectivity problems. Media Player is a basic audio player that allows audio playback, allows the audio to be submitted to 2RC cloud-based Speech Services for speech recognition (requires an account), and importing of audio (integration with Transcribe Assistant). Notification Assistant provides background monitoring of one or more folders to recognize when a new file is created. Once recognized, Notification Assistant sends an email notification to the address specified globally for the folder or, if an author ID can be determined, sent to an author-specific notification email address. The Notification Assistant appliction also supports visual notification of a new file with a supported USB LED inidicator light. Speech Services is a cloud-based, pay-as-you-go speech recognition service provided by 2RC Software. Pay-As-You-Go: With an account that requires no monthly subscription, users can purchase time credits that allow audio to be submitted for automated speech to text. Phonetic Spelling: Use phonetic spelling (alpha, bravo charlie, ...) for accurate recognition of names, license plates, policy numbers and other non-standard words. Substitutions: Use pre-defined substitution lists or create custom substitutions to enhance recognition results and reduce editing time. Phrases: Provide a custom list of words and phrases that you use regularly for improved recognition results. Enhanced Formatting Commands: Recognizes numerous punctuation, currency, list bullets and other special characters to reduce final editing required. Speech Recorder is a speech recording application for your mobile phone that is specifically designed for professionals that dictate on a regular basis. Health-care, legal, insurance and law enforcement professionals will benefit from the convenience of using the mobile device they already have and Speech Recorder's powerful features to allow easy creation and distribution of dictations. Use Speech Recorder with or without an account. 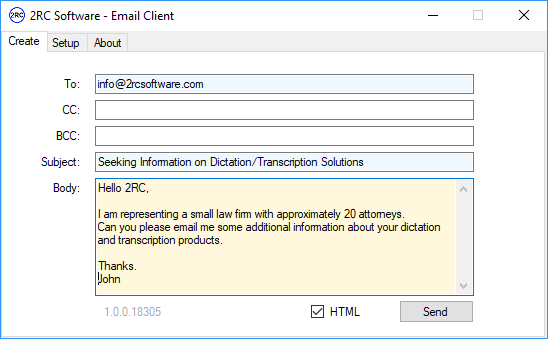 A 2RC account provides additional features such as dynamic metadata definitions and selections, additional distribution options, and speech recognition. Creating an account is free and allows you to purchase Credits. Credits are required for some enhanced features of Speech Recorder. Speech Recorder is ideal for professionals in health services, law enforcement, legal services, and the insurance industry. Record audio for dictation, note taking, interviewing, etc. Even more features available with a 2RC Account!